Mushrooms are not just amazing items to toss in your gourmet meals. These are also highly beneficial food items that can help to improve your overall health. There are so many different varieties that each have their own benefits to your health. Read on to learn more about Maitake mushroom. The name maitake mushrooms means “dancing mushroom”. This mushroom is also known as “sheep’s head”, “cloud mushroom”, and “king of mushrooms”. This fungus is native to China and it was a popular choice for ancient Chinese medicine. Maitake mushrooms are polypore mushrooms that grow in clusters. It is also a popular medicinal mushroom also in the Japanese culture. It is a giant mushroom, having grown to over 100 lbs. in Japan, which is why it gets the name “king of mushrooms”. In the past 20 years, this has become a popular choice in the West for supplements to naturally help improve their quality of life. While it is native in China, it can also be found in the Northeastern part of the United States, parts of Europe and Japan, and in Canada. It can be commonly found in hardwood forests and will typically grow around oak trees, but you can also find them around elm or maple trees. Maitake mushroomscan be found at the base of the trees. What is important to know about maitake is that it is a perennial fungus, meaning that it can grow in the same spot for several years in succession. This is especially common in the Northeastern United States, thought you can find maitake mushrooms as far west as Idaho. Interestingly, it’s Latin name is “Grifola frondosa”, which is a reference to the mythical animal the griffin.Maitake mushrooms were also mentioned in a Japanese legend, where some Buddhist woodcutters and nuns met while on a mountain trail. They discovered the maitake fruiting and coming up from the ground. They were so excited to have found such an amazing mushroom that they danced in excitement, which is why they call this the “dancing mushroom”. The texture of this mushroom is much more pleasing than other mushrooms, which is good news for people who are not big fans of mushrooms. They are delicate and have great flavor. There are a few different ways you can consume this. You can cook it up with your meal or purchase it as a powder or pill supplement. 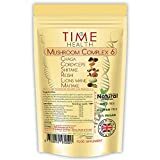 Research is continually being done to discover more benefits of consuming this mushroom. As with any supplement, it is important to discuss adding this to your diet with your doctor. 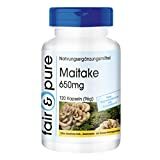 While there are no real known issues with maitake mushrooms, it is important to look for signs of an allergic reaction whenever you are consuming a new food item.